When the Huawei Ascend P6 launched last spring, it turned heads. First, because the design seemed at first glance entirely derived from the iPhone, though as you looked down at the bottom end there was a different styling at play. 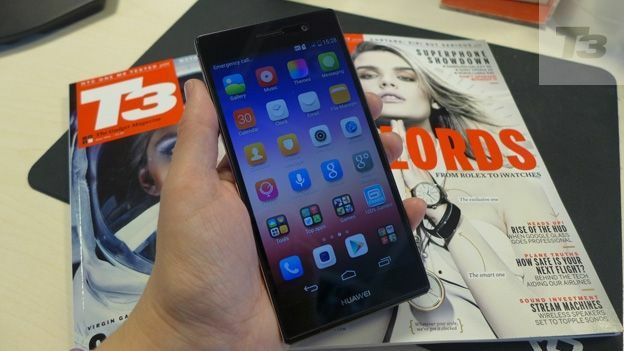 Now, the Huawei Ascend P7 has arrived, with an identical design language. It looks better, though, because the aluminium back of the P6 has been replaced by Gorilla Glass which looks fetching where the metal P6 just looked, well, plasticky. This time it's a classy and subtly patterned back which is smooth, tactile and pleasing to look at. And though this is a phone which will undercut the top-flight phones out there in terms of price, Huawei (pronounced 'wah-way') wants you to see the Ascend P7 as a strong and powerful alternative to the likes of the Samsung Galaxy S5 and the HTC One M8 – so how does it stack up in terms of style, features and all-round goodness? This phone isn't quite as razor-thin as the P6, but at 6.5mm there's precious little in it. It's still thinner than the iPhone 5s and it has a bigger screen that's much higher-resolution. And it's 4G-capable, unlike the P6. For many people the absence of super-fast data connections was not a problem but the networks, it seems, like 4G for everything but the most budget of smartphones now. Though the P7 has again positioned itself as great value, it's not budget. The display is bigger than before – matching the five inches that premium phones like the HTC One M8 offer. This is a Full HD screen so you can feast your peepers on a 441 pixels per inch display (considerably more than the iPhone's 326ppi). Put a picture on the screen and you can't miss the richness of the image: colours pop without being overdone while text is as sharp as on paper. It looks tremendous. What's more, because this screen is so big, it's almost a surprise how thin it is, as though the proportions are off. But the truth is the slimness of the Ascend P7 feels great in the hand, making it feel less of a palm-stretcher than the Sony Xperia Z1 let alone the new Sony Xperia Z2. For all its slimness, the phone feels solid and strong, with no flexing evident. Oh, and because the display stretches to within 3mm of the edge of the phone, it's an even more impressive screen. Turn it on and you instantly know you're holding a Huawei phone thanks to the distinctive Emotion UI, including a special panel called the Me Widget that is easily customised to include important contacts, music player, weather and more. It could be a crucial part of your experience of the phone. Or you may never use it. But the Emotion UI is subtly different from other Android interfaces. At first it seems hardly skinned at all but where other Androids have an icon on the home screen which leads you to all your apps, here they're all spilled out on the second home page. The only concession to this is that some of these are folders such as Top Apps, Tools and Games. If this sounds familiar that's because it's as similar layout to the iPhone's grid of apps and folders, which some will see as missing out on the greater flexibility Android offers. One of the icons is for an app called Phone Manager – a powerful and precise tool to control a lot of details on the handset that's a very welcome addition. It includes power management which is useful because a phone this slim doesn't have space for a massive battery. If you want to block spam messages or calls, then you can do so with the Harassment Filter. Handy if you're tired of advertisements landing in your text messages. There's also a page where you can add numbers to a blacklist from messages, your call log or, if you must, your registered contacts. You can also manually type in numbers. When a blocked number calls you get a notification of “Blocked content” and the call is redirected to voicemail. Actually, the cell here is a 2,500mAh model which isn't bad and can manage a full day's use without resorting to the less power-hungry modes. Though if you do reach just 10 per cent of battery life, then the phone takes over and limits consumption automatically. The phone has a more than reasonable processor on board – a quad-core 1.8GHz model which is no slouch. There are faster chips available and it lacks the lightning speeds found on the iPhone 5s, but this is still a nippy chip and should see you use the phone without it slowing down. And it's a quick phone for downloading. No surprise given that it's made by the company that makes dongles and enterprise hardware but it includes fast data traffic capabilities. Last year's P6 introduced a selfie-optimised front camera. Where other phones only had 1MP or 2MP front-facing camera sensors, the Ascend P6 had a 5MP model. Coming just when selfies were gaining popularity, it made perfect sense. This time around, Huawei has gone further with another first: this time the front-facer has 8MP resolution. There are also extra modes such as panorama selfie: hold the phone up and take a shot then turn it to the left and then to the right to add to the picture content (the phone takes the second and third shots automatically). This is an efficient system even if the results are variable. You can also take group selfies (Huawei calls these groufies – please don't say this word yourself) just by turning the phone to landscape setting. There's one really cool extra for selfies: as you prepare to shoot, a thumbnail of the shot appears in the top corner of the screen. This may seem superfluous but if you look at the thumbnail, your eyes appear to be looking directly at the camera, resulting in a much-improved pic. Clever. As with the P6, this phone has a beauty mode which will smooth wrinkles, improve skin tone and generally make you look better. Great for Tinder until you meet your date at least. Really this is just a soft focus effect and makes you (or at least us) look like a plastic doll. We ask you, is that what you really want? The rear camera has a decent 13MP sensor and takes great shots. If there's a fault, it's that the lens is so close to the edge that it's easy to find your finger in shot, but this is true of a bunch of cameraphones and is easy to get used to. The Huawei Ascend P7 is a great-value phone, making other premium handsets like the iPhone 5s and HTC One (M8) look pricey. For all that, it lacks the sheer class of those phones and the Huawei operating system isn't quite as slick as other rivals. Processor speed and battery life are more than passable and Huawei has built clever operational details in so it's easy to extend battery life and block nuisance callers. The phone's display is crisp and super-sharp – really easy on the eye. If you're a fan of selfies, this phone is meant for you, thanks to an 8MP front-facing camera. There's also a good 13MP rear camera. If the price were significantly higher, this would be just another high-end phone. As it is, it packs in a lot of value for money.